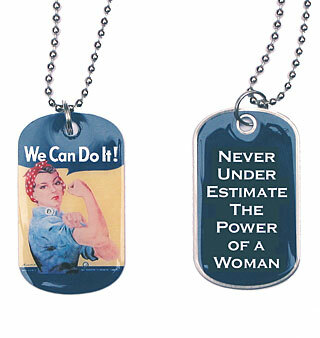 Rosie the Riveter Dog Tag Rosie image is offset printed on a stainless steel, epoxy coated for durability, and attached to a 24 inch military -type ball chain. Reverse side proclaims: "NEVER UNDER ESTIMATE THE POWER OF A WOMAN". Size: 1.96" x 1.14" Comes with a Rosie the Riveter Sticker in the package. Two great gifts for the price of one.